A part of each sold digital art print goes to charity. By purchasing the Charity Prints you not only have a piece of art, but you also support an organization that does great work! Boston Terrier with colorful floral background of anemones and tulips. 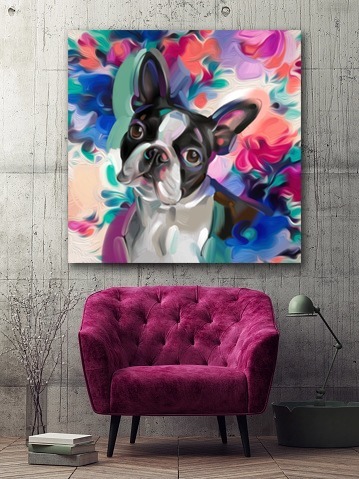 50% of the sales of 'Joy' gets donated to MidAmerica Boston Terrier Rescue. Visit their website or facebook page to see the wonderful work this organization does in rescuing and helping so many precious Boston Terriers in need. The digital painted print is being delivered as jpg.file. You can get it printed on canvas by your local or online print shop on the desired canvas size of your preference (or any other product, like a pillow or bag). For personal use only, no commercial use or reselling to thirds. © Wendy-Beugels, all rights reserved. Copyright stays with artist at all times.